In the original My Baby Boy/Girl game on Nintendo DS, you helped raise a virtual baby from birth to its first step. Now in the sequel, My Baby: First Steps for DS and Wii (Wii version reviewed here), you’ll be continuing on, raising your baby to help it walk with more confidence and teaching its first words. My Baby: First Steps is quite a bit like the first game, except now you’re dealing with a young toddler who has just started to learn to walk and babble, around 15 months old. First you enter in your name and choose to be the baby’s mom or dad. Then name your baby and decide its gender and ethnicity, or let it be a surprise! Each month, your pediatrician will have two exercises for your baby to learn, which use the Wii remote to help baby progress. Once you fill up the meters, you’ll go on to the next month’s exercises. Most either require you to help your baby walk or talk. To help him or her walk, run, or carefully climb the stairs, usually you take a ‘cuddle toy’ with the remote and shake it in the direction that you want baby to go. Sometimes you may have to swipe the remote quickly either horizontally or vertically to encourage baby to squat or run. Some of these movements are a little hard to figure out at first, but if you read the pediatrician’s instructions carefully, you should be able to figure it out. But your baby won’t learn anything if it needs something, and it’ll let you know through its whimpers and actions. If he rubs his tummy, he’s hungry. If she rubs her eyes, she’s sleepy. If he fidgets with his pants, he needs a diaper change. And if she fusses with her arms, it’s bath time. Later on, your baby will even ask to play outside in the sandbox. A nurse will guide you through each care station for the first time. These care-giving games can be a little tricky to figure out the first time you play them, but they get easier after that. The diaper changing game is a lot like the one from the last game. Use the remote to take off the diaper, clean baby’s bottom, put medicine on it if need be, then throw away the dirty diaper and put on a new one. The motions you go through are very similar to changing a real diaper. In the feeding game, use the remote to pick up a spoon and move it to the bowl of food. Wiggle the remote to cool it down and then hold the spoon near the baby’s mouth for him to eat it. Later on, your baby will drink from a sippy cup and even ask to feed himself. Just watch his body movements and you’ll be able to tell what your baby wants to do at mealtime. At bath time, baby sits in her bath seat and you must wave the remote to scrub her with a soap filled sponge. Just don’t rub too hard or she’ll cry. Easy gentle movements are the key for any of the games on My Baby. Then rinse her down with the shower head. It’s a lot like the cleaning games in other DS care-giving titles. Later on, your baby will be able to communicate better and will want to play outside in a sandbox. Your job is to hand your baby the toy he wants. If it’s not the right one, your baby will throw it back. Later on, it sounds like your baby will even utter a slurred “thanks” when you hand it the right toy. So at least you know it’s a polite little tyke! The bedtime game is the weirdest of the bunch. Your baby will look at a bedtime storybook and motion for you to turn the pages with the remote. Turn off the light at the right time when baby nods off. What’s weird about this game is it looks like the baby is reading the book, not you! I wonder what kind of books this kid is reading! Just like in the first My Baby game, you can take pictures of your baby and send them to Grandma or the photo shop. When you send a picture to Granny, she’ll give you a present, and if you send the photo to the shop, you’ll get money to buy items for baby. You can dress your baby in all sorts of clothes, hairstyles, and also buy toys and room decorations. So it looks like First Steps will end up being more of the same for My Baby fans. Hopefully kids will be able to figure out the tasks better in this game. Any child who enjoys playing with dolls and playing ‘house’ may want to check this title. And I think it would make a great present for an older brother or sister who has to share their life with a new member of the family. All the tasks you do in the game, a kid can help do in real life, so it can help prepare them for caring for their younger siblings. And even though it’s just a game, I could see the progression from taking care of a babbling droolhead to an actual little person. And maybe that aspect will encourage kid gamers that the new baby in the house will grow up into someone that they can play with and be lifelong friends together. 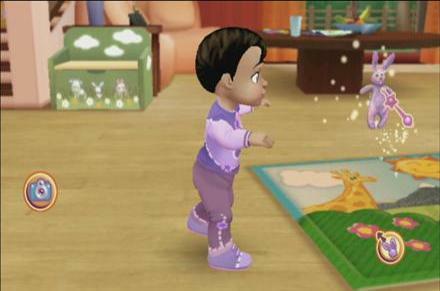 My Baby: First Steps is rated E for Everyone. i want this game so much! how much does the ds version cost? The diaper change and the bath are greyed out on the game. What do you have to do to have access to these?